Healthcare facilities that excel at controlling hospital-acquired infections (HAIs) understand how integral heating, ventilation and air conditioning is to maintaining indoor air quality (IAQ). 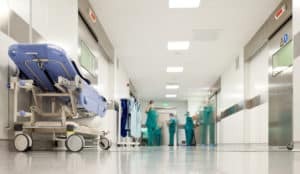 Vital for the health of patients and staff, to maintain the highest levels of IAQ, timely commercial heating and cooling repair and maintenance are key to upholding the strict industry standards surrounding hospital HVAC equipment. Is your facility helping or hindering the propagation of infectious agents with its current HVAC practices? Commercial HVAC contractors in Philadelphia know temperature and humidity are key facets of indoor air quality. As warmth and humidity increase, so to do the presence of bacteria, viruses, fungus. A cool yet comfortable temperature and low relative humidity between 30-60%, kept in check with the aid of your heating and cooling system and a Dectron dehumidifier, are crucial. Without proper care and maintenance, these systems can put vulnerable patients at risk. The CDC estimates hospital-acquired infections occur in 5-10% of U.S. hospital patients annually, infecting 1.7-million, taking the lives of 99,000 people, and resulting in $20-billion in healthcare costs. Are you skimping on HVAC maintenance that threatens the safety of patients, leaving you liable for legal and reputational backlash? With the crucial role temperature and humidity play in this regard, proper HVAC function in all areas of a hospital, but most importantly, within operating and clean rooms, cannot be overstated. Poorly maintained systems may be unable to maintain the temperature and humidity levels necessary to minimize bacterial growth. To prevent dangerous pathogens from building up within HVAC system components and ductwork, or taking hold when your system isn’t performing up to par, regularly scheduled service and maintenance are integral. Commercial heating and cooling contractors are on the frontlines of the battle against hospital-acquired infections, keeping systems operational and clear of mold and organism growth that can lead to hazardous indoor air quality. Such preventative maintenance also helps spot issues before they arise, preventing downed HVAC equipment from threatening the health and safety of patients and staff, and reducing the likelihood of relying on emergency HVAC service to restore comfort and safety in the event of system malfunction. Commercial HVAC systems, particularly the often highly-customized setups of hospitals containing high-level HEPA air filters, UV light air purification, and dehumidification systems, require the keen insight of a skilled professional. To ensure the health and safety of your patients and staff, trust in the skilled staff at H&H Commercial Services, the best commercial HVAC company in NJ. With 29-years in the industry, our knowledgeable, experienced technicians are equipped to handle the intricacies of any commercial setup. Experience our winning services first-hand, whether you’re in need of 24-hour emergency service, or are ready to safeguard your system and hospital inhabitants with a customized preventative maintenance plan. Contact H&H Commercial Services to learn more today.